So, I finally tried out a new method for macarons - the one using Italian (or Swiss?) meringue. That means you cook sugar and water to a specific temperature, and whisk into foamy egg whites to make a really shiny meringue. 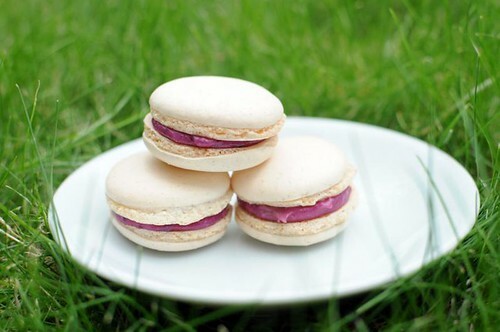 The method is a bit fiddlier than my usual one and the macarons themselves are slightly different. -they're whiter and shinier, probably because the meringue itself is, too. -I baked them for a slightly shorter time, and a slightly warmer oven than I usually do - about 160°C for 10 minutes. -They all got feet, but some were a little lopsided. For the filling, the only hard part is making the black currant purée, but it's worth the effort! I'll share that, but not the recipe for the shells - it needs some perfecting. Make the purée - finely mix the black currants and press through a sieve. Make sure you have 50 g of purée. Ja... svårt att säga. De här blir plattare med lite mindre fot, tycker jag. Men de andra är enklare... Nä, gör båda varianterna, så ser du vad du trivs bäst med. Och dagens tips: det går INTE när det regnar. Tack för hjälpen! Då börjar jag med ett lättare recept först och testar detta därefter. Och sista tipset är guld värt eftersom jag bor i regniga London. Tack! wow your macarons are wonderful !! So beautiful, and the color of the filling is spectacular!